It’s hard to overstate the value of an education. According to Census Bureau data from 2016, the average worker with a bachelor’s degree earns $51,600 per year. That is roughly $22,000 more than the average worker with a high school diploma earns and $30,000 more than a worker without a high school diploma earns. But as everyone knows, getting an education can be expensive and is getting increasingly so. From 2006 to 2016, the cost of college tuition and fees increased by 63%, according to the Bureau of Labor Statistics. Compounding that problem is the fact that many students take on massive amounts of student debt to pay for college, hindering their ability to save for retirement or buy a home. However, in some states, public colleges are still affordable and offer students excellent earning opportunities. Below we rank the best states for higher education. In order to come up with our rankings we looked at five factors. Specifically, we compared the states across student-to-faculty ratio, average net price, undergraduate graduation rate, in-state attendance rate and the 20-year return on investment. Check out our data and methodology below to see where we got our data and how we put it together. 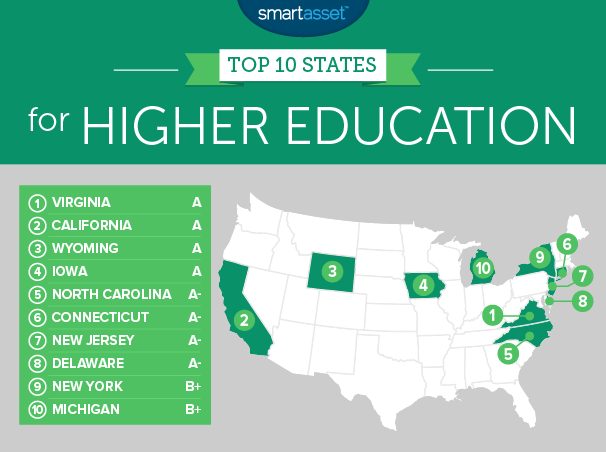 This is SmartAsset’s fourth annual study on the best states for a higher education. Read the 2017 study here. Consistency – For the third year in a row, Virginia and California occupy the top two spots. Eight of last year’s top 10 also ranked in the top 10 this year. Mixed bag – No one area dominates more than another. Some Northeast states, like New York and New Jersey, rank well, as do some Southern states like Virginia and North Carolina. California also gets an A grade while in the Midwest, Michigan secures a top 10 spot. This makes four years in a row in which Virginia was either the best or second-best state for higher education. Schools in this state have a graduation rate of 71%, or second-highest in our study, and offer their students great long-term value. Our data shows that schools in Virginia offer a 20-year average return on investment of $417,711, or fourth-most in the study. 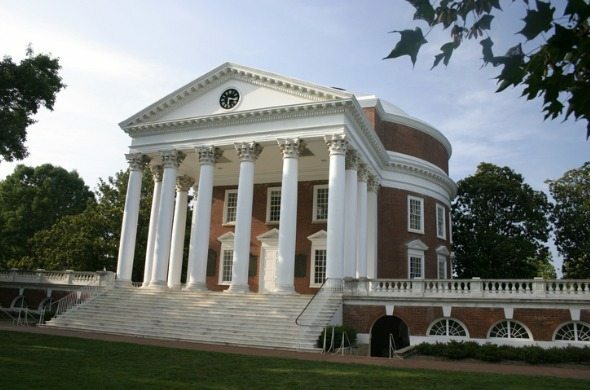 Attending college in Virginia is on the more expensive side, this state ranks in the bottom 10 for average net price. California once again secured a spot among the top two. This state ranked well in all but one of our metrics. Schools here have the second-highest 20-year return on investment and the fifth-lowest average net price. However, for students who prefer an intimate class experience California may not have the best options. According to our data, California has a student-to-faculty ratio above 24, the highest in our study. The Cowboy State takes third. This state ranks highly because of how many locals attend state colleges. Around 62% of high school graduates in Wyoming end up attending local 2-year or 4-year institutions. For that metric, Wyoming ranks 10th. Wyoming schools also have low student-to-faculty ratios. Its student-to-faculty ratio is 14, fifth-best in our study. With some improvement in the graduation rate (currently 55%), Wyoming might be able to climb into one of the top two spots. No public colleges do a better job at graduating its students than Iowa. Overall, 72% of students in public colleges in Iowa graduate, the highest rate in our study. Students tend to do well once they graduate, as well. The 20-year return on investment for graduates of public schools in Iowa is $369,400, ninth most in the country. Once again North Carolina scores well in in higher education. Not only does North Carolina score well in this study, but this state contains many of the best community colleges in the country. On average, attending one of North Carolina’s public colleges is fairly affordable. The average net price for the 2015-2016 school year, according to The Integrated Postsecondary Education Data System, was $11,500. North Carolina ranks 12th in that metric. Most students who attend North Carolina public colleges graduate, according to our data. North Carolina public colleges and universities had an average graduation rate of just under 61%. Connecticut ranked sixth this year, jumping half a dozen spots from last year. Public colleges and universities in this state have some of the lowest student-to-faculty ratios in the country. At 13.9 only three states have a lower student-to-faculty ratio than Connecticut. But perhaps more important is the graduation rate. Around 66% of students at public institutions in Connecticut graduate, the fourth-highest rate. Connecticut’s score is hurt by the fact that most graduates of Connecticut high school decide to go out of state for their higher education. The newfound money that many college graduates come into following their exodus from school can be daunting to manage. In turn, we’ve outlined the top financial advisor firms in Connecticut. The Garden State takes the seventh spot. Public colleges and universities in New Jersey do a successful job graduating their students. Our data shows that the average New Jersey public institution has a graduation rate around 68%, the third-highest rate in our study. New Jersey schools also have a low student-to-faculty ratio and a better than average 20-year return on investment. Delaware secured another top 10 spot in this study. This makes four years running where the Delaware state university system was rated in the top 10. What makes attending Delaware state institutions so good for its students is the long-term value. According to our data, the average Delaware public college or university has a 20-year return on investment of $423,000. Combine that with Delaware having the seventh-lowest student-to-faculty ratio and it’s no surprise this state ranks so high. New York has some good all-around scores. The average public college or university has a student-to-faculty ratio of 15.7 and an average net price of just under $12,000. Both of those scores are in the top 20. New York has a graduation rate of 55% and 20-year return on investment of $356,000, also two scores which beat the majority of other states. In fact the state only has a below-average score in one metric: percent of high school graduates who attend an in-state public college or university. Our list ends in the Great Lake State. Overall Michigan gets a B+. This state’s public institutions seem to be well-loved by its high school graduates. According to our data, around 62% of Michigan high school graduates went on to attend one of Michigan’s 2-year or 4-year public colleges. While Michigan had no top 10 scores it also had no below-average grades. Undergraduate graduation rate. Data comes from the Integrated Postsecondary Education Data System. Data is for the 2015-2016 school year. Average net price. This metric considers the average yearly price for first-time, full-time undergraduate students. Data comes from the Integrated Postsecondary Education Data System and is for the 2015-2016 school year. Student-faculty ratio. This metric also comes from the IPEDS data center. It’s from the 2016-2017 school year. 20-year return on investment. This is the difference between 20 years of median pay for a graduate with a bachelor’s degree minus the costs for attending the higher education institution for four years and 24 years of median pay for a high school graduate. Data comes from Payscale. In-state attendance rate. This is the percentage of students who graduated from high school in 2015 who went on to attend an in-state college. Data comes from the Integrated Postsecondary Education Data System and the Western Interstate Commission for Higher Education. Data for metrics were found using a weighted average of the schools in each state. We ranked each state in the five metrics. We then found each state’s average ranking, giving a double weighting to graduation rate. Using this average ranking we created our final score. Our score was graded on a curve with the top 15% of states getting an A and the bottom 15% getting an F.
Deduct it from your taxes. While there was some talk of eliminating the student loan interest deduction the new Trump tax plan left it in place. This means you can deduct up to $2,500 in student loan interest payments from your taxable income. Refinance. If you find yourself struggling to pay off your student debt, one option may be to refinance. If you refinance all your student loans it is possible to get access to lower rates or to extend the life of the loan to lower monthly costs.